High-accuracy, optically-guided center drilling increases material yields on superalloy powdered metal processes (PMP). 3-axis drill integrated into the Center Drilling system provides high-accuracy positional drilling. This maximizes material yield by allowing minimum removal of the outer casing. Therefore, the largest diameter is yielded from the Powdered Metal billet. Billets from 6″ thick up to 48″ long are accommodated on the part holding cradle. The cradle contains hold-down straps that keep the billet in place during drilling. The feed rate is adjusted in the software to allow for different material alloy types. After the billet is placed into the part holding cradle, 3D cameras image the billet under ideal lighting conditions. The edges of the superalloy are visible as edge boundaries. The highest-yield diameter is then extracted under operator control for maximum control of the yield. 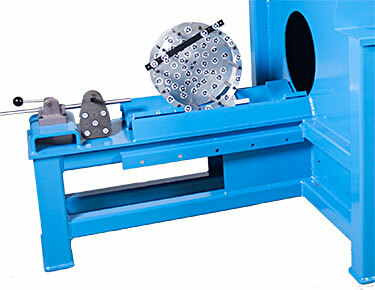 For each part number, the diameter is logged and fed downstream to the lathe operation. The drill rate results in a cycle time comparable to or faster than traditional methods, while improving accuracy. Constant-feed (as opposed to constant force) rates minimize work hardening of the material during drilling. Solid-steel and powder coated exterior construction can withstand bumps from the work area. The software outputs a report to scheduling personnel to feedback into an efficient process for inventory control. NIST-Traceable calibration artifacts ensure compliance with ISO/ANSI/MIL standards, and ensures consistent measurements. The software User Interface was designed specifically for this process and requires minimal training while providing all functionality that operators request. System maintenance can take place by in-house maintenance personnel. Powdered metal superalloys are some of the toughest metals on the planet, and require special considerations regarding drilling forces, work-hardening, and feed/speed rates. The Center-Drilling system was designed from the ground up to perform on these materials, providing peace of mind to customers for this critical process.